The finding could influence conservation efforts; instead of focussing solely on where the animals live, protection should also consider which dialect they use. "All the evidence for culture relies on methods of exclusion. It's very difficult to actually prove cultural transmission,' says Rendell. 'But our finding isn't consistent with anything other than cultural dialects." Sperm whale pods are made up of females  with a few young  and average around 12 individuals. Male sperm whales leave the pod when they're juveniles and join all-male pods for a few years, before beginning a solitary life roaming the oceans. 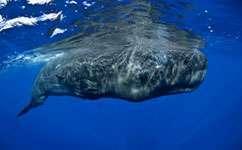 This latest study, published in Behavior Genetics suggests that sperm whale groups are made up of individuals that use the same dialect, rather than those that come from a similar area of the Pacific. "The whales make the sounds in the 'big tub of oil at the front of their huge heads", explains Rendell. Along with air sacs in the whales' heads, the structure produces multiple pulses, just fractions of a second apart. No surprise, they have to be able to differentiate each other. I'm curious if dolphins and porpoises can understand each other to some extent ? Behavioral contagion is not culture. Take about the sound pattern contagion and the biology of sperm whales remains the same. Not so humans who cannot exist except for the skills they pick up. Human pick up culture through our capacity to infer mental states. No other animal does. No nonhuman animal further cares about culture--but humans use culture to mark themselves out as different and "better". Speak the wrong dialect and you are outgroup. There is no evidence of that click pattern differences have this function in sperm whales. An important part of having culture is the possibility and stigma of being "uncultured". Nothing exists like this in nonhuman animals. The all reason animal researchers talk about "animal culture" is to game funding bodies for grants by implying an false and misleading importance to understanding humans. I think an interesting experiment would be to place a orphan whale with a different cultural group and see if the calf still speaks the dialect it was born into or if it picks up the foster groups dialect. Or, if sperm whales do not accept different babies, one could do it with a calf being raised by humans - do these calves still speak a dialect? As for the culture, as anyone else seen the beluga whales bopping their heads to the mariachi band in that video. All they need is some sombreros to make it a little more obvious that the mexican culture extends beyond humankind.